11 months 2 weeks ago. 1 year 1 week ago. Libby....so wonderful to see you and all the inspiration of your work with so many talented composers! You are a special gift to all of us. 8 months 1 week ago. I am deeply saddened to hear of the death of my dear colleague, Richard Waggoner, who passed away on April 10th. Richard was a bright soul and a brilliant musician who touched the hearts of everyone who worked with him. My deepest sympathies and wishes for peace to his family in this difficult time. 11 months 2 weeks ago. Good morning, Libby. A few weeks ago the Mississippi College Singers performed your "Buffalo Gals" setting as our closer on a concert for the State MMEA/ACDA Conference in Hattiesburg. The audience loved it as much as we enjoyed performing it – a LOT! Here's a link to the Youtube video: 1 year 2 weeks ago. In the March/April issue of "Journal of Singing," American composer Libby Larsen’s song cycle, "My Ántonia," is given detailed harmonic analysis and character motivation in Gregory Zavracky’s “A Guide to Libby Larsen’s My Ántonia.” http://ow.ly/zpaT30iWrKH 1 year 1 month ago. Veni creator Spiritus is on my June recital programme. (I came upon it too late for February and other slots are already filled!) 1 year 2 months ago. The solo vocal music catalogue of Libby Larsen has become a substantial staple in the American Song repertoire. As a feminist and advocate for women in the Arts, this album celebrates some of Larsen’s most beloved song cycles in which women poets and characters are the central figures. Larsen has always gravitated towards the stories of strong women: hardship-enduring women like Cather’s Antonia, gender-role defying women like Calamity Jane, and the ill-fated wives of Henry the VIII, Larsen lifts up the virtues and highlights the universal struggles of women throughout history. 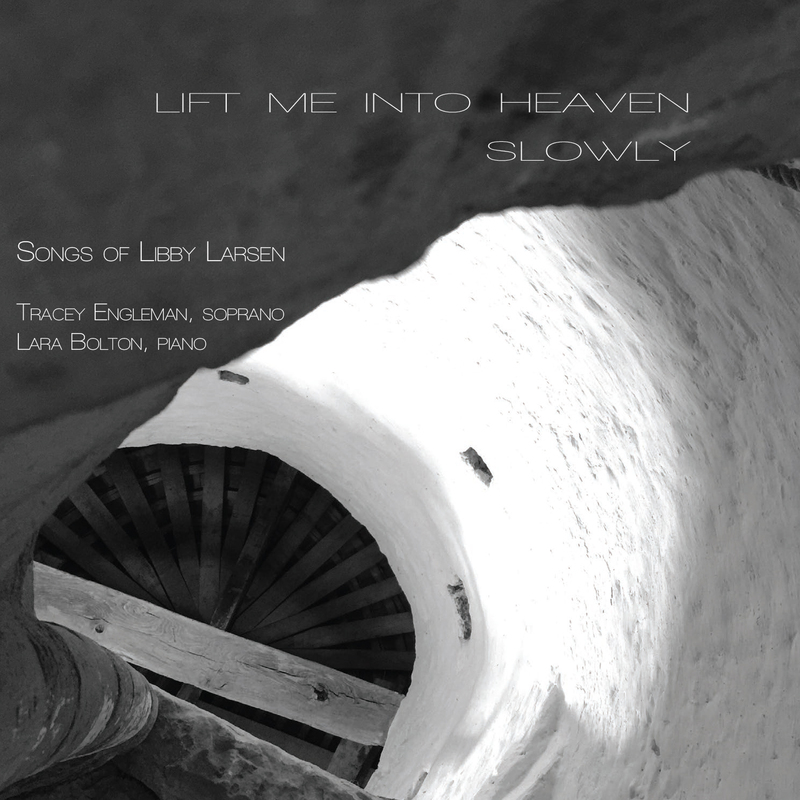 This collection of four song cycles span more than 20 years of Larsen’s compositional output. From her earliest studies in the art of text setting in Cowboy Songs, to the vivid musical landscapes of My Antonia, to the bleak last days of the Queens, Larsen utilizes musical texture, rhythm and melody in a way that unleashes the “theater of the mind” for the listener. With a musically dramatic flair, Larsen chooses to tell relatable stories through arcing melodic lines over a distinctly modern, but traditional harmonic language. Imagery and mood are strong in these works: from the bucking horse brought to life through the piano in “Bucking Bronco,” to the slow, spacious texture and utilization of the blues scale in “Lift Me into Heaven Slowly,” to the interweaving of the American cowboy song “Goodbye, Old Paint” in “Billy the Kid,” Larsen’s writing creates vivid characters and images of the Old West. Calamity Jane’s letters to her daughter resonated with Larsen on many levels: the challenges faced by working women, the honesty of the mother-daughter relationship, and the directness and pride of the language. The landscape is featured in the story of Jim and a young immigrant girl, Antonia; the harsh realities of early life on the Midwestern plains, and of lives on different trajectories. Libby Larsen is one of America’s most performed living composers. She has created a catalogue of over 400 works spanning virtually every genre from intimate vocal and chamber music to massive orchestral works and over twelve operas. Grammy Award winning and widely recorded, she is constantly sought after for commissions and premieres by major artists, ensembles, and orchestras around the world. As a vigorous, articulate advocate for the music and musicians of our time, in 1973 Larsen co-founded the Minnesota Composers Forum, now the American Composers Forum, which has become an invaluable aid for composers in a transitional time for American arts. A former holder of the Papamarkou Chair at John W. Kluge Center of the Library of Congress, Larsen has also held residencies with the Minnesota Orchestra, the Charlotte Symphony and the Colorado Symphony. With a voice the Boston Globe called “extraordinary in range, tonal quality, musicianship and dramatic effect,” soprano Tracey Engleman has gained a reputation for excellence in opera, recital, and concert. Ms. Engleman was most recently awarded the prestigious 2016 McKnight Artist Fellowship for Musicians. She teaches at St. Olaf College in Northfield, Minnesota. Pianist Lara Bolton has been engaged as a coach-pianist at Minnesota Opera, San Francisco Opera, Washington National Opera, San Diego Opera, Seattle Opera, Chicago Opera Theater, Opera Santa Barbara, West Bay Opera, Opera Colorado, Amarillo Opera, and Mill City Summer Opera where she currently acts as chorus master and principal pianist.